The St. Brelade’s Bay Hotel is nestled in the middle of one of Jersey’s most attractive south coast bays, offering guests four star service and plenty of excellent dining experiences. Originally opened in the 19th century and set in five acres of private grounds, the hotel was completely renovated during 2011 and has joined the exclusive club of 4 star luxury hotels in Jersey. Visitors to the hotel are spoilt for choice when it comes to food and drink; from the oak-panelled dining room to the hotel’s extensive gardens, diners can enjoy the best local food, wine and cocktails, all the while taking in panoramic views across the bay. The St. Brelade’s Bay features three fantastic venues for enjoying meals and drinks – The Bay Restaurant, The Petit Port Café and the hotel’s Cocktail Bar. All three are served by the hotel’s experienced staff and talented chefs, including the long-standing head chef Franz Hacker and the even longer-standing Maitre d’Hotel, Leon de Biasi. The highlight is the hotel’s a la carte menu, serving a choice of classic local dishes and popular favourites. 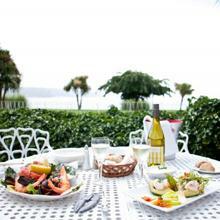 The menu makes use of the island’s fantastic supply of vegetables, dairy ingredients, fish and meats. The restaurant also serves a popular set Sunday lunch and a daily lunchtime Plat du Jour. Fish-loving diners will love the selection of starters, which reads as a must-taste of Jersey’s seafood. Shellfish highlights include avocado tails filled with white Jersey crabmeat and Scottish smoked salmon, sautéed local scallops with vine tomatoes, garlic butter and a green pea mash, and – for slightly larger appetites – seared fillet of bass served on a pesto crostini. Main courses take inspiration from a variety of sources, as guests can choose from a selection of pastas, seafood and filling meat dishes. The most tasty treats are undoubtedly the steaks – entrecote, fillet or ribeye – served with chunky chips and a sumptuous collection of sauces: peppercorn, mushroom, stilton or port wine. Elsewhere you can sample a classic plate of beer-battered fish and chips with mushy peas, a grand plate of fresh Jersey lobster or a light plate of linguini pasta with basil, crème fraiche, sun-blushed tomatoes and woodland mushrooms. When it comes to desserts, the St. Brelade’s Bay sticks to the classics, offering a small selection of sweet temptations, a cheese platter, and coffee with petit fours. If you have a sweet tooth and enjoy a decadent dish, you can’t go wrong with the Bailey’s creme brulee, served with short bread and a rich chocolate ice cream. As well as their year-round a la carte, the St. Brelade’s Bay Hotel also serve a daily changing Table D’Hote menu, perfect for guests staying at the hotel on half board. With a modern health club, a perfect location opposite the beach and excellent fine dining accolades, the St. Brelade’s Bay is a perfect hotel for a short holiday in Jersey. You can book your hotel accommodation with us, inclusive of flights or ferry travel to the island. This entry was posted in Jersey Restaurants and tagged St. Brelade's Bay Hotel. Bookmark the permalink.